2009 appears to be the year of the mega-dungeon, with grognards and 4E fans running back to adventure in epic dark tunnels full of monsters, magic and mayhem. There are environmental concerns despite all that healthy Gygaxian naturism er, naturalism. With this, you may want to consider the following things about the physical environment of the dungeon. Denizens may also be aware of these environmental issues. Air - Apart from air quality (an environmental hazard) which in caves and tombs is not always wonderful, the presence of wind currents implies a nearby exit or the presence of magic. Portals to places where air is fresh may provide a ready-made exit yet be a risk if you can't see what's on the other side. Air purity may also be a concern with the presence of strange mists, volcanic vents and mines, explosive, toxic or noxious gas. Wind currents can be variable. 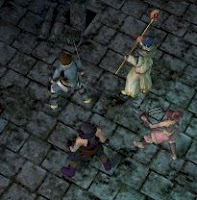 The presence of heat may cause updrafts and the presence of airborne moisture can create mists and clouds that may affect gunpowder, obscure visibility or make it humid and uncomfortable; the presence of dust or sand may be airborne (shaken from footsteps overhead or formed from the grinding of stone on stone) and indicative of disturbances in the fabric of the dungeon itself. Flight is unusual (unless you're a bat or something similar) unless you're in a large cavern or expansive tunnel; it's unlikely a dragon will be able to negotiate a dungeon's tunnels without magic or some kind of adjustment to the environment. Where flight is possible, the introduction of a third dimension allows those who can use it significant tactical advantages in either initiating combat or withdrawing from it. Remember rock is subject to forces like compression, tension, shear, twisting or bending that cause tunnels to move and distort without the aid of magic. This may lead to distorted features (which look insanely cool) and may presage a collapse. Structures built within the dungeon (like bridges) may need to consider load and vibration. Perhaps the fire giant is trapped because the bridge collapsed. How far can you jump? Fire - Provides heat, light and opportunities for pain to your characters. Unless you're undead, extraplanar or otherwise exempt from lethal loss of temperature, heat may be a concern for you. Fuel sources may be an issue if you're not near a convenient volcano, gas vent or mine - particularly in an area where there is plenty of water (which absorbs heat wonderfully). Illumination is another concern, particularly for certain monsters. Fire is a popular choice of weaponry for a trap-maker; although protective magics against fire are often a staple of adventurer magic it is in attrition that fire can be effective. The destruction of paper or wooden items by fire can provoke greed like few other things and usually targets those that should know better. Also in using their protective magics, it softens up the wary for later attacks and painfully teaches the unwary caution. Fire has many functions in a dungeon; from the candles which can indicate passage of time for a trap to forges where weapons are made or repaired to funeral pyres for the unwary. It's presence indicates civilisation (even rough and crude ones like the PCs) and how it is used will present strategies for those who live in the dungeon when they have to deal with other denizens. How else do you think the oozes are handled down here? Water - Water helps shape a dungeon by it's presence (when a mummy's sarcophagus is ten feet underwater, burning it can be problematic and it doesn't need to breathe either) or by motion (anything from underground rivers to the slow drip formation of stalagtites and erosion of caves linked by an underground stream). It uses a sculptor's hand to caves by forming gypsum formations and paint a cave wall with striations. It can also bring a dungeon to life. The vast majority of creatures need to drink and free-flowing water may have fish or plant life which forms the diet of the local denizens. While dungeon hygiene is not an urgent priority, stagnant water can breed algae, disease and similar memorable experiences. Battles around wells can be vicious when it's the only water source available and well poisoning takes on new significance for chaotic evil races. The sunken dungeon is a consideration for the prepared and a death-trap for the unprepared. Providing chances to explore underwater can put traditional parties on the back foot if their magic or might are affected by the environment. Different rules may apply for combat. Running a sunken dungeon also requires preparation but can provide chances to use some different creatures and some intriguing environments. Bone - One for those with plenty of bodies and limited space. The morbid artistry of such can be breathtaking as well as providing concealment for those undead who cast off their flesh but not their bones. If magic is involved, the bones may be providing structural integrity, necromantic sorceries or a guard service. These tend to be used for cemetaries so bashing down the walls may invite divine reprisals as well as undead incursions. Ice - A counterpoint to fire, this requires cold, the presence of slippery walls and treacherous floors as well as those creatures who live in such climates make many experienced adventurers clutch their weapons a little more closely. Although fire tends to prove effective against those creatures, it's presence in a dungeon made of it can cause dangerous collapses which in itself it's own kind of response. Metal - The presence of metal at this level of construction implies wealth. Such material is usually arranged in cunning mechanisms or heralds the presence of a trap; stories of certain dungeons being strange vessels cast of metal reach the ears of incredulous bards from time to time. Metal panelling is occasionally found in some of the wealthier sections or in rich tombs, often with some auxilliary purpose.